The Professional Regulation Commission announces the official results of the Psychologist Licensure Examination and Psychometrician Licensure Examination this July 2015. The people behind this successful administration of exams are the following: Ms. Miriam P. Cue, Chairman; Ms. Alexa P. Abrenica and Ms. Imelda Virginia G. Villar, Members. 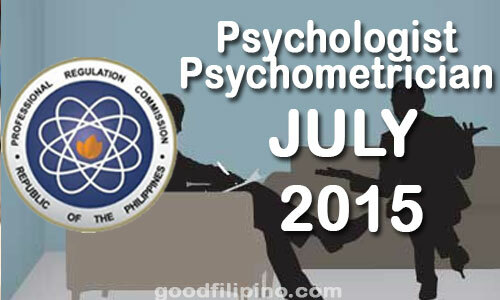 PRC and Board of Psychology conducted the Psychometrician board exam on July 21 & 22 while the Psychologist board exam was done on 23rd and 24th of month of July 2015. Psychometrician Licensure Examination was given in the cities of Manila, Baguio, Cebu, Davao and Legaspi and the Psychologist Licensure Examination was done in Manila. The Professional Commission usually released the said board exams in four (4) working days after the last day of examinations. Comments or suggestions about "July 2015 Psychologist and Psychometrician Board Exam Results - PRC List of Passers (July 2015)" is important to us, you may share it by using the comment box below.